“A large body of international evidence shows that self-reported life satisfaction is a credible approach to measuring the well-being of a population. Given the policy interest in maximising people’s well-being, there is a need to better understand what makes people satisfied with their lives. 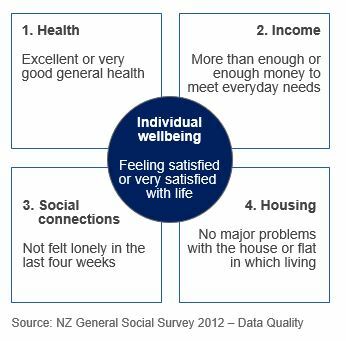 Stats NZ found that four measures in the regression model showed the strongest independent relationship with overall life satisfaction: health, income, social connections, and housing (see figure). Stats NZ applied these four primary drivers of wellbeing to the data from the General Social Survey 2016. They took the life satisfaction scale, which runs from 0 and 10, and labelled those participants with a self-assessed life satisfaction of 0-6 as ‘low overall life satisfaction’ and the others with a self-assessed life satisfaction of 7-10 as ‘high overall life satisfaction’. Each participant in the survey could have a good outcome for 0 to 4 of the four primary drivers of wellbeing. 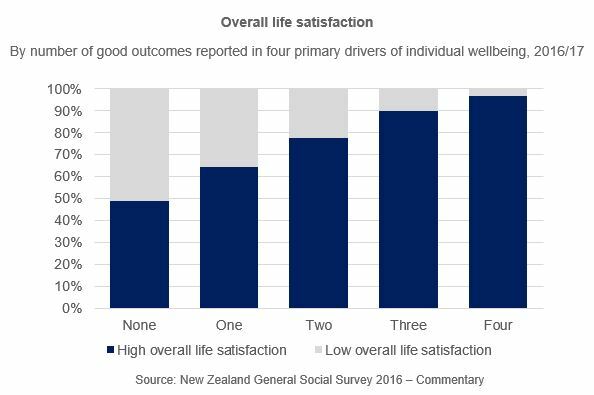 For all participants who had none of the primary drivers of wellbeing, Stats NZ looked at the proportions with low/high overall life satisfaction. They repeated this for all participants with 1, 2, 3, and finally 4 primary drivers of wellbeing. The results are shown in the figure. almost all (96.7%) of those participants with all four primary drivers of wellbeing had a high overall life satisfaction. As a consequence, not feeling lonely has a strong relationship with wellbeing in New Zealand.